A farmer in Morocco with an Evaptainer prototype. The assignment was to come up with a product that would improve the lives of one billion people. Quang Truong, who was a graduate student at the Tufts Fletcher School and MIT, thought of spoiled produce. He'd seen a lot of it in his travels around the world. It's no surprise he did. In developing countries, about 470 million small farms lose an average of 15% of their income to food spoilage. The problem, in part, is refrigeration. The high cost of electricity, coupled with its unreliability, makes even the best refrigerator just a useless hunk of metal. 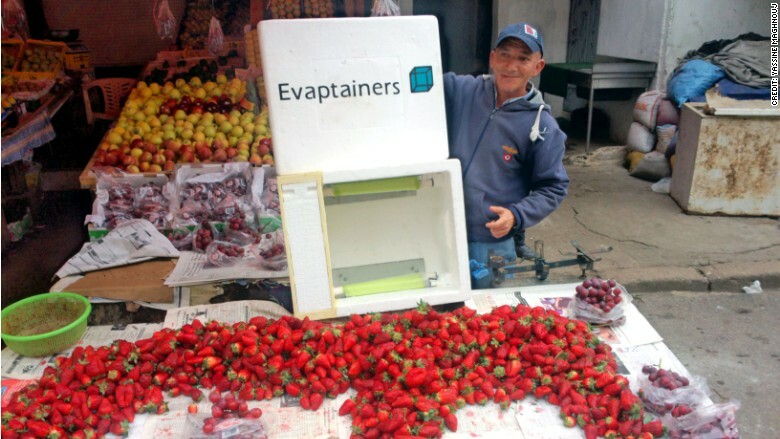 "A lot of NGOs have given refrigerators to farmers, who say thank you, and then they come back three months later and they're using it as a shelf," said Spencer Taylor, who teamed up with Truong to co-found Evaptainers, a for-profit company based in Boston. Evaptainers are refrigeration devices that look like a large cooler and run on sun and water. The heat is drawn out of the unit's interior onto highly conducive aluminum plates. They're connected to a special fabric, which is kept wet, and the heat naturally dissipates through evaporative cooling. It needs six liters of water to work, and keeps things cold for 12 hours. "If you are growing vegetables, you have an access point to water and are already invested in watering and growing a crop," Taylor said. "It's a very small additional investment." The $10 to $20 units are an improvement on a traditional cooling method used throughout much of Africa and the Middle East. Called a zeer pot, it's one terra cotta pot nested in a larger one, with wet sand filling in the gap between. It works, and uses that same evaporative cooling technique, but it's heavy and breakable. When designing the Evaptainers, Taylor said they eliminated fans, pumps and anything breakable because "this needs to be able to drop off a moped and still work." The units hold 60 liters of produce. In practical terms, that's about 150 large tomatoes. Taylor estimates a small farmer using one or two Evaptainers would reduce spoilage and increase profits. "Previous studies on evaporative cooling technologies and zeer pots show an average income increase of 25%," Truong said. "We estimate a payback period of two months per unit, based on increased income from reduced spoilage." Taylor and Truong have invested $20,000 in the company so far, and aren't yet paying themselves. "We're driven by the mission," Taylor said. They have no outside investors. The device is still a prototype, and a pilot program rolled out in Morocco a couple weeks ago. It's still small -- just two units -- but more will arrive in the next few weeks. They partnered with a farming cooperative so the farmers don't have to pay for the coolers. Morocco offers a solid testing ground. There are only 1,500 refrigerated trucks in the entire country, and while data on food spoilage is slim, Truong said there is "some consensus that between 30% to 35% of food produced in Morocco rots before it reaches the end consumer." Reception has been positive so far. "People here thinks it's magic," Truong said. "They stick their hands inside and feel the cool aluminum plates -- but they see no plug, compressor, electrical wires or solar panels -- so there definitely is some astonishment." Truong said Moroccans in the pilot program are using the containers to refrigerate higher-value fruits and vegetables that spoil quickly, like tomatoes, leafy greens, Moroccan dates, olives and berries. "However, there are a few other local flavors I thought were interesting," he said. "One is a special kind of cactus meat, which is a delicacy, and apparently as expensive as beef steak."